At WI I received a lovely gift in the lucky dip. It was a silver bag containing a little silver and diamanté heart and 2 bottles of Sanctuary; a brand of luxury bathroom products. It was lovely, although as I only have a shower, it may be passed to someone else! The word ‘sanctuary’ comes from the Latin root word, sanctus, which means holy. So the primary meaning of the word is, ‘a sacred space’. Following on from this is the idea of a ‘place of refuge’, where someone can escape to and find safety. In the year 2000 I retired exhausted from full time working, and spent a year seeking ‘sanctuary’ from a life so busy that it had overwhelmed me. 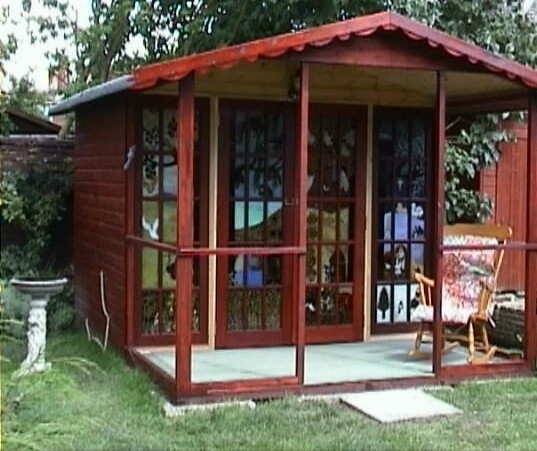 Being too ill to go anywhere, my sanctuary had to come to me, so my wonderful husband built me a summerhouse at the end of the garden where I could find some healing peace. It was 3metres by 4metres made of solid wood lined with tongue and groove pine panels with a waterproof, pitched roof and 4 doors. Each door had 12 glass panes and I was inspired to paint them with glass paints. At the time I was reading “Landmarks”, An Ignatian Journey, by Margaret Silf and the book inspired me to consider my faith journey. Knowing that the Domain in Lourdes has been the most formative place in my faith life, and thinking (wrongly) that I might never be well enough to go there again, I decided to reflect its importance in my summerhouse. Each door would have a depiction of the grotto and of water included, as well as images that I love. for each door. I used trees, laburnum, wisteria, maple, holly, bending towards each other to form arched shapes. I then drew images from nature related to each season, mice, hedgehogs, robins and anything else that came into my mind. Once the paper design was complete I stuck the paper onto the back of each door and drew over it straight onto the glass with ‘tube lining’. This dries quite quickly so then I started to paint! I am not an artist so the result was very primitive, but because the glaze comes in such beautiful colours, the overall effect was stunning. Once the doors were hung we laid electricity cables to the summerhouse so that we could light it from inside or out. This meant that at night we could see the stained glass effect shining down the garden from the house. If I was in the summerhouse on a sunny day with the doors shut, the stained glass effect cast coloured light all over the inside of the summerhouse. If I was in there at night I sometimes turned off the lights and lit candles to gain a different effect. This was my sacred space, my sanctuary, my still point, my little bit of Lourdes and I loved it. In my summerhouse I looked deep inside my self; I wrote my life story; I restored my spirit; I emerged a different person. Sadly, I had to move home 3 years ago, and I could not take my summerhouse with me. But I have the photographs and I just have to think of it to find a beautiful stillness. This entry was posted in Cotswolds, Creativity, Depression, Education, Musings, Photography, Remembrance, Spirituality and tagged Lourdes. Bookmark the permalink. A sanctum sanctorum has always been a must have for me. Your summer house, your sanctuary is very beautiful. I’m thrilled for you that you had the opportunity for this experience in your life and that it proved to be exactly what you needed. I know that you will find your own sanctuary where ever you may be. A new one that represents the newness of you, that empowers, that helps you find strength, peace and encouragement. Thank you so much for sharing this part of your life. The pictures you drew are beautiful I’m so happy you shared them too. Also love your blog name! What a wonderful husband. I loved your description. Felt like I was walking through with you! Thanks for sharing! Yes he is pretty amazing. How we met is a long story but we only married when I was 50 – 15 years ago. It was the best thing I ever did. This is so lovely and artistically done. I’m going to be moving to a new home soon, and will be doing my best to create a sacred space there. We’ll be leaving behind the sacred space of where we now live with a bit of sadness. The way I’ve been dealing with it is by visualizing how this home and space can become a gift for someone else. I’m sure whoever now owns your former home is blessed because of the sanctuary that you and your husband created.